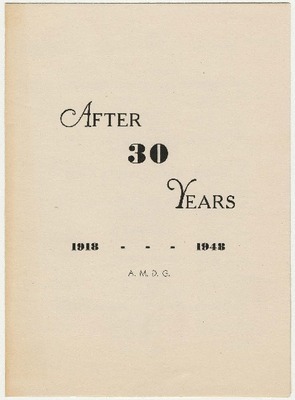 Program for the thirtieth anniversary reunion of the St. Xavier College Unit of the Student Army Training Corps held at the Hotel Sinton in Cincinnati, Ohio on December 4, 1948. 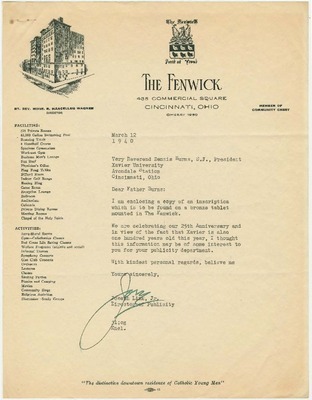 Letter from Joseph Link Jr., Director of Publicity for The Fenwick, to Xavier University President Dennis Burns, SJ regarding a bronze tablet that had been erected by members of Xavier's Students Army Training Corps unit at the Fenwick Club. Included is a transcription of the tablet, which honors the sisters and nurses who cared for the students during the 1918 influenza pandemic.